Are you ready to experience an all-new touring rock festival featuring everyone from the hottest up-and-coming acts to the biggest names in the genre?? 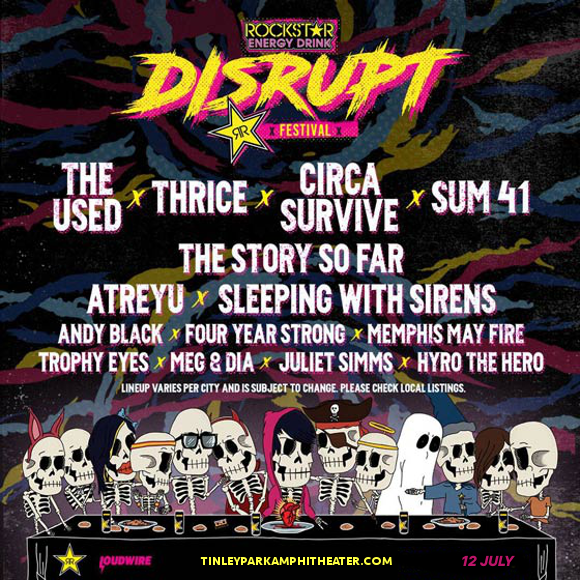 This year, for the first time, Rockstar Energy Drink brings you DISRUPT Festival, with performances by The Used, Thrice, Circa Survive, Sum 41 and Atreyu!! It’s an epic lineup at one unbeatable price – get your tickets now and get on down to the Hollywood Casino Ampitheatre on Friday 12th July 2019! 2019 is a very special year – marking the year of the very first Disrupt Festival, brought to you by Rockstar Energy Drink! And it’s an ambitious debut, too, with the tour and it’s changing lineup bringing the show to an amazing 25 cities across the United States. Taking place across two stages, at the Disrupt festival fans will be able to experience all their favorite bands live on one day. And that’s not all – the Disrupt Festival is more than just a music event. In addition to being able to see an absolutely unparalleled lineup, fans will be offered the chance to interact with the hottest lifestyle brands and pop-up activations, tying into the popular culture surrounding the bands and their music! The Hollywood Casino Amphitheatre festival on Friday 12th July will feature performances from The Used, Thrice, Circa Survive, Sum 41, Atreyu and MORE – no modern rock/metal fan can afford to miss this!! Tickets are going to disappear FAST so don’t dawdle – hit the “Buy Tickets,” button and get yours while you still have the chance! !